After the kitchen, the bathroom is one of the most frequently utilized rooms in the home. Give your bathroom the makeover it needs to become as comfortable as it is functional. This stylish bathroom done in modern tiles and fixtures includes an over-sized tub and a heated towel rack. Proper lighting can make the difference between a bathroom that comes across as warm and welcoming and one that is cold, dank and uncomfortable. Adding more windows to allow additional sunlight isn't always that expensive, and incorporating accent overhead lighting can also make a tremendous difference. A Jack and Jill bathroom connects two bedrooms, and typically includes two sinks as well. Make this a fun, neutral area by giving it a pop of color that is gender neutral, like this bright orange. The cabinets help conceal personal items, while leaving plenty of space for two users as well. In some homes you'll find a half bath that actually has enough space for a shower stall. Keep in mind that a shower stall needs at least 33" of space, while a toilet needs 36" to sit in by itself. If these numbers work out, adding a shower stall can increase the value of your home. Help open up your small bathroom and make it appear much larger than it is. A splash panel on the tub keeps water contained while allowing the area to remain open. A wall-hung sink and clean tile lines help to give the appearance of a taller, longer wall as well. The cool colors used throughout finish the job by receding from the eye to visually enlarge the area. Make your half-bath seem much larger than it actually is by tiling the walls up to wainscot height in the same color as the floor tile. This creates an optical illusion that the room is much wider and longer than it actually is. By changing the texture from the floor to the walls, you help keep the design fresh and interesting. Another time-tested trick that you can use to create the optical illusion of a larger bathroom is to install a full-sized mirror either on a wall or a large closet door. The reflection of your entire bathroom gives the impression that the room is much larger than it really is. A full-size mirror also offers the added advantage of the convenience to check out your entire outfit every day with very little effort. Open up your bathroom by making use of the corners. Tubs, showers and even toilets can all be installed in what was previously unused space. By locating the tub in this corner, it opens up the space for a separate shower stall on the side. His and Hers sinks do not have to be side by side. By placing them on either side of the whirlpool tub, it makes the space appear larger and adds a pleasing sense of symmetry to the overall design. If you're using a tile that has a lot of character, like marble, consider using it throughout the bathroom. 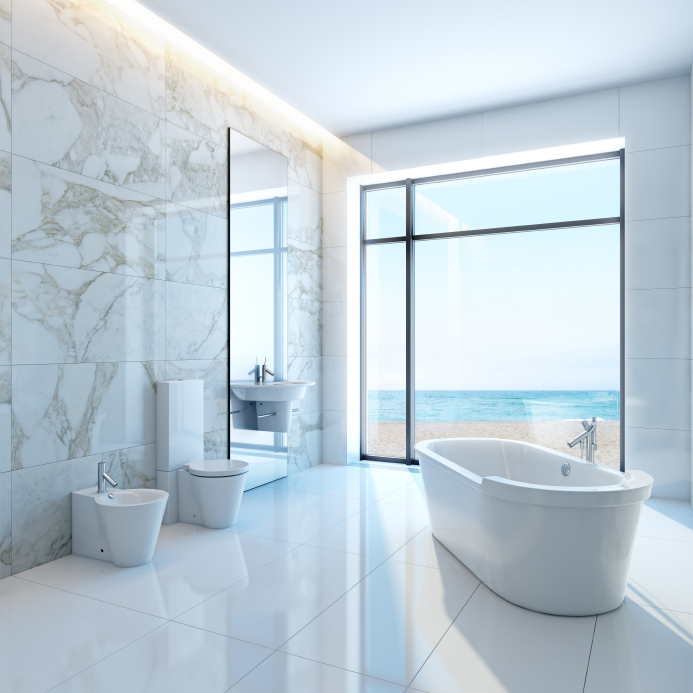 By placing the same tile on the floors and walls, as well as in the shower, it helps to create a cohesive design that calms, rather than agitates. Using tile to create walkways and "rugs" in the bathroom helps to delineate the space and add interest. This border helps separate the two sections of the bathroom without walls or curtains. Create a soothing, spa-like quality in your bathroom by utilizing fixtures that have clean lines. Over-sized tiles on the floor, and an open shower help to make the bathroom feel spacious, while the gently curved sinks add interest and detail. For more bathroom inspiration, check out these bathroom tile ideas.